Hauskaa lauantaita, tervetuloa viikon Allsorts haasteen pariin! Ensi viikolla juhlimme taas Naistenpäivää, joten viikon aiheeksi valitsin "Ladyille", siis aikuiselle naiselle. Voit käyttää myös kukkia, mutta tee naisellinen kortti. Hi; Happy Saturday, it's time for a new Allsorts Challenge! It's my time to host and I chose the theme for "Ladies Only"! It's the International Women's Day week and let's celebrate adult woman this time. Your creation could be a floral too, but make it feminine. Our prize comes from Digistamp Boutique and an extra stamp set is drawn too. Vielä ei päästä näin keväisissä ilmoissa siivoilemaan, mutta käytetään hyväksi lunta ja pakkasta, tuleepa raikas tuoksu sisälle! It's a super card for your theme Mervi, one I always enjoy as well. Minus 20 sounds a bit harsh to me so keep warm. We had more snow overnight and it looks very pretty but we are cut off from the village, the joys of living in the middle of nowhere. Upeat värit, todella harmoninen kortti! What a perfect stamp you used for the theme, a beautiful card and thank you for the fabulous theme! A really fabulous card, love the image and a great background, super colour choice. Too cold for both of us to be hanging washing out at the moment, don't know how you cope with such temps. 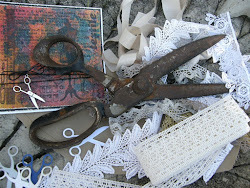 I love your card, Mervi, what a wonderful image and rustic papers matched together, it’s really beautiful! Beautiful creation! I love vintage style! Wonderful image and papers! Ompa ihana kortti vähän vintagetyyliin.Kiitos kun kommentoit blogissani ja toi vähän epäselvä Allsorts challengessa (ei osunut säännöissä)silmiin voiko käyttää digileimoja? Very beautiful! LOVE LOVE the colors! Thanks for joining us at CraftyHazelnut's Patterned Paper Challenge for March!